Why keeping board attendance to a manageable size leads to better outcomes. Research on corporate boards has consistently shown that the overall size of a Board matters. As a general rule, smaller Boards are more cohesive, more hands-on, and more efficient. Studies show that the optimum size for a decision-making group is seven people and that each person added above this reduces effectiveness by ten percent 2. Fewer voices around the table leads to more space to dig into issues with follow-up questions and extensive debate, leading to quicker and better decisions. Even eye contact and candor have been shown to change when Boards exceed ten Directors. One recent study of 400 large-cap businesses across ten sectors, including energy, telecoms, technology, health care, and industrials, found that companies with smaller Boards (i.e., eight to ten Directors) generated substantially higher shareholder returns on average across a three-year period3. It is no surprise that publicly traded firms are embracing smaller Boards. Water Street has benchmarked the formal Board size in hundreds of JVs and recently looked at 36 natural resource sector JVs where we also had access to data on the number of actual attendees. This provides an interesting picture of how well Boards in the sector are doing (Exhibit 1). On the one hand, the average number of formal Board members is 8, and the median number of Board meeting attendees is 12 – both within the ballpark of acceptable. On the other hand, a third of Boards have at least five non-Board attendees at every meeting – and most of those have more non-Board attendees than Directors. 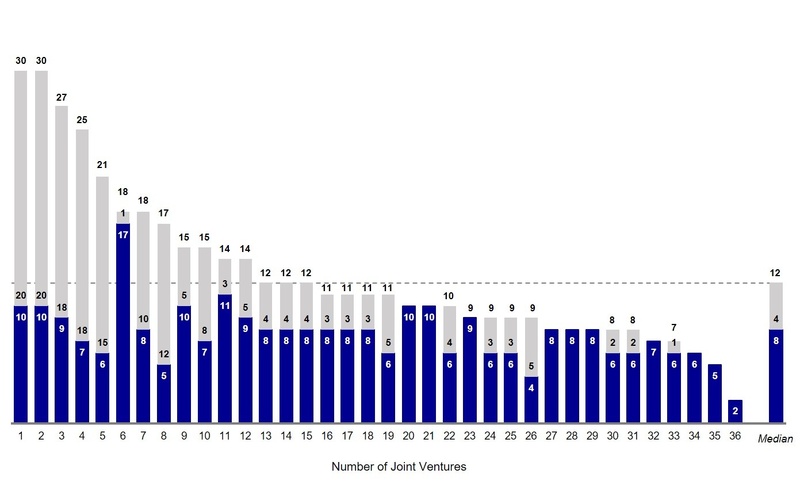 Furthermore, 10 of the 36 JVs we benchmarked have Board meetings with 15 or more participants, with some reaching a median of 30 attendees. Not surprisingly, JVs that have sought our help in improving their Board and governance performance are disproportionately represented in the JVs with 15 or more Board meeting attendees. Keeping Board meetings manageable is a product of two factors: How large the Board is, and how the participation of non-Directors works. Based on our client experience from 500+ JVs across the last 30 years and 20 major research studies on JV governance, we believe the following measurable indicators drawn from our Standards of Governance Excellence represent “best practice” in Board size: ... Click below to download the entire article, including best practices. 1 For simplicity, we use the term ‘Board’ to refer to the senior governance body overseeing a joint venture. Depending on the legal structure and jurisdiction, this body may alternatively be referred to as Members Committee, Management Committee, Operating Committee, and other forms.